Mr. Gaston Melies, who is seeking the unusual and as yet unpictured local color of the South Pacific, has with Mrs. Melies and his company, reached his first stopping place al Papette on the Island of Tahiti, one of the Society Islands, known once as the Sandwich Islands. What a golden mine of romance is waiting for this adventurous picture maker! It was in this neighborhood that Robert Louis Stevenson lived for so long and where so main of his best romances were written. It has been said that here is romance’s last great stronghold and that it can be found nowhere else on earth as here. There are stories like fairy tales of strange gods and of magic, and there are stories of beautiful Polynesian princesses (they usually have a hibiscus flower in their hair) who swim like mermaids. There are also stories, quite historical, of great warriors and heroic deeds of valor, of gun-runners, of diplomatic intrigues, of treasure hunters, and no one before this has been on the spot nor dared to make pictures of island life; because they lacked the local color. Mr. Melies has had the boldness and is likely to reap the rich harvest that is waiting for him. Of course, to take a large party (there are sixteen players and operators) on so long a trip is a very expensive undertaking. They intend to take pictures in many parts of New Zealand after leaving the South Sea Islands, and before they return they will have crossed Australia and taken pictures in Java, where the life and customs are radically different, in India and elsewhere. The pictures that Mr. Melies intends to produce will include dramas and comedies as well as educational films. A taste of the life of these strange lands will be in the dramas and in them will probably be shown the life and experiences of white settlers with natives around them. The educational films will be of great value. The purely native life in many of these out-of-the-way corners of the world is fast changing into a hybrid life. To catch what may still be found of ceremonies and customs of the simple South Sea Islanders is as worthy a work as can be found for a motion picture camera. We have no doubt that it will repay Mr.Melies many times over, although he expects that the trip will cost something like $200,000. These pictures that he will take, in all probability, rise above an unfortunate condition of the picture market that producers have found it hard to contend with. This difficulty is the purely local popularity that certain types of pictures have found. It is, perhaps, more noticeable in the type of picture called “Western,” the picture exploiting cowboy and Indian life. These are very popular in the South; but are not very acceptable to spectators in the Northwest nor on the coast. The picture of any kind that will be liked abroad is seldom the best kind of picture for American audiences. Hut pictures of life in the South Seas, of life in New Zealand, of life in the Dutch provinces, of Java, of India and Ceylon, etc., will have so great an interest that they will find no hindrance in local requirements, but will appeal as strongly to Americans as to Europeans; they will also appeal to the cultured and the unlearned, for both will find entertainment and the best instruction in them. Things that are new and strange, yet true, are greatly desired. If such are not to be found in the South Sea Islands and in Java, where on this earth, except in Thibet, will they be found? We are looking forward with the greatest eagerness to the releases that the travelers will send back, like letters home, to us. Perhaps the first, which will be sent from Tahiti, will be released late in September. The purely educational films will be made by George Scott, who has managed the Melies factory for many years. He will travel much alone, taking with him only a carrier to help with the apparatus, and may make adventurous excursions “into the interior” for special films. We hope he will be adventurous not too adventurous. It would be too bad to lose one’s life for a picture. Then, also, some good films may be lost, if a headhunter chief should become very much irritated, for instance. The dramatic stories will be prepared by Edmund Mitchell, about whom “Who’s who” has a long paragraph. Mr. Mitchell is a much-traveled man and has written a shelf full of novels, as well as guide books, etc., to parts of India. He is thoroughly familiar with the islands in the South Sea and with Australasia, and has written many able articles about them. Among his novels are “The Temple of Death” a story of Bombay and Central India, and “The Lone Star Rush” a story of western Australia. These, with many other works of fiction by this author, have, according to competent critics, strong plots and vivid local color. Mr. Mitchell’s presence with the company promises stories that will be very well worth while. Besides these two men the full troupe consists of Bertram Bracken, the director; Hugh McClung, dramatic operator; Gustave Henschen, photographic operator: Samuel Wiel, stage manager; John Ortega, master of transportation: Henry Stanley, characters: Wm. Ehfe, juvenile lead; Ray Gallagher, heavy: Leo Pierson, juvenile; Miss Mildred Bracken, juvenile lead: Miss Fanny Midgley. character; and Miss Hetty Tracy, ingenue. 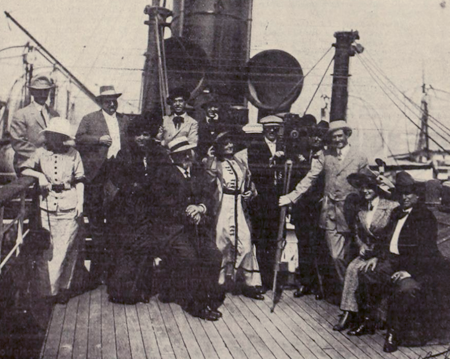 The photograph printed herewith shows the party on the ship Manuka, just before sailing. Questa voce è stata pubblicata in Cronologia 1912, Produzione e contrassegnata con Gaston Melies, Star Film America. Contrassegna il permalink. Gaston Meliès filmed in Texas, Immortal Alamo in 1911 with Francis Ford, brother of John Ford in the role of Davy Crocket. I’ll be posting more about this film in a near future.